Råda Säteri, situated about 10 km southwest of Göteborg, Sweden just outside Mölnlycke, the restaurant is located inside a house built in 1772, is surrounded by a horse farm, with a wide expanse of rolling green lawn leading down to the lake. Pär and Helena have run the restaurant since 1996, after Pär returned from the United States where he was working as a chef in San Francisco for two years. His culinary experience also includes working for three years as a pastry chef apprentice at a Michelin restaurant. 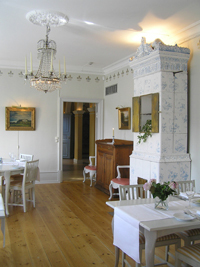 In August 2005, Carin Klemetz, Edward F. Nesta and I had lunch at this gorgeous antiques-filled restaurant, which is part of Vastsvensk Mersmak, which translates as Taste of West Sweden. 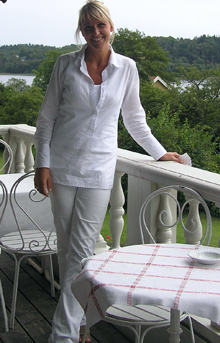 This program was launched in 2000, to promote tourism to West Sweden, as a gourmet destination to showcase the culinary excellence of West Sweden from its fresh local produce, to its dairy fresh products, to its locally caught seafood and game. In order for restaurants to participate, they must be selected and then pass rigorous training in order to receive certification. We sat in a pretty light-filled dining room at a table by the window with stunning views of the lake. The décor was elegant Scandinavian; white tables with pristine white linen table runners, lilac roses sat in square-cut glass vases, crystal chandeliers sparkled, blue and white china lined a plate holder on the wall, and there were paintings throughout the dining room, as well as a white ceramic fireplace in a corner of the room, that created an old-world charming ambience. For our lunch, Carin and Edward began with a starter of smoked wild boar with ligonberries, and I had a starter of goat cheese, peaches, ligonberries, greens and red onions. Homemade fresh bread, as well as typical flat bread, was served with a delicious spread, which was a mixture of mashed potatoes, mashed white beans, herbs, garlic and olive oil. For our second course, Carin and Edward selected the lamb with lamb sausage, and I selected the hake with a potato cake, fresh asparagus and a pepper sauce. The tender lamb was served with a tiny lamb sausage accompanied by mashed potatoes and a braised onion. The fish was served over a rectangular cut potato, with a pepper sauce, green and white asparagus and cherry tomatoes. Both of dishes were visually appealing as well as being very well prepared. 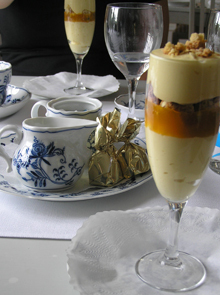 Dessert was a sweet finale of a parfait of zabaglione with a layer of passionfruit and a layer of biscuits. Afterwards, we took a tour of the historic restaurant that has long attracted famous guests, and saw their unusual “guestbook” located on the second floor. In the 1800’s, famous guests would sign the “windowpane guestbook”, using a diamond to etch their names on the windowpanes. In 2001, United States President George W. Bush visited the restaurant, and added his signature to this rather unique guestbook. There is also a lovely sitting room on the second floor where guests are invited to relax and enjoy their coffee. Read about Sweden in our Destinations, Hotels & Resorts, Restaurants and Chefs’ Recipes sections. © December 2005. Luxury Experience www.LuxuryExperience.com. All rights reserved.